Jim’s Home Painters Marsden have the pleasure of adding a dash of colour to your life. Because, life without colour is unimaginable! In the natural world, Mother Nature uses an array of colours with a purpose. Her colour isn’t random, her colour attracts, warns and informs. In the man-made world, using the right colour can set a mood or create an image. Jim’s Exterior Painting Marsden are colour specialists, keeping up to date with current international trends and forecasts, and able to assist you with colour advice and ideas. An initial consultation with you is important. Jim’s Home Painters Marsden like to listen. Listening is vital to gain a proper understanding of your needs and desired look. And, if you’re not sure of anything, Jim’s Exterior Painting Marsden are happy to make suggestions for you to think about. Professionals from Jim’s Home Painters Marsden come armed with all the latest and greatest specialised tools and equipment that can create any effect you desire. They are constantly researching new tools, technology and products to ensure you receive the best possible service all round. 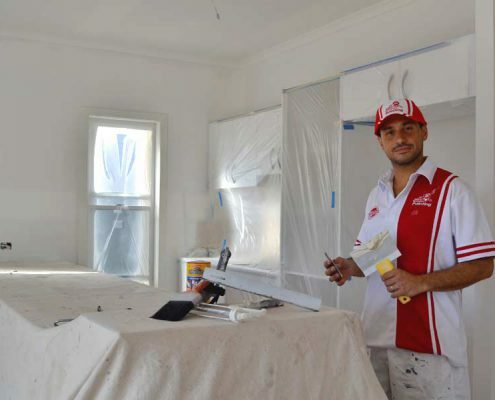 We are part of a full-service painting division belonging to one of Australia’s biggest franchising groups. For over 25 years, the Jim’s brand has built an honourable reputation for providing premium services together with excellent customer service. We are fully aware that cost can play a big part in keeping our customers completely happy and satisfied. Therefore, we aim to provide you with an upfront, transparent and detailed quote. That way you know exactly what services you will get. Don’t worry if you have a strict budget for your commercial painting project, we are happy to work with you and tailor a painting package to suit your needs. Our painting service includes more than just the paint job. Rest assured your floors, fixtures and furniture will be protected. Outlet covers and light switch covers will be removed or protected. An inspection of the painting surface will be carried out. A full surface preparation will be done, including repairing any cracks, holes and damaged surfaces. Also, when the painting job is finished, you can be certain your home or business will be left clean and tidy. We also appreciate the importance of time and deadlines. We can organise our work structure to meet strict deadlines so that you are not left in the lurch. Jim’s Home Painters Marsden are not only professional, we are reliable as well. When you are looking for the complete package to service your painting needs, try the Jim’s Home Painters Marsden experience. Call 131 546 today or get a free quote online, you won’t be disappointed.